The Series Circuit: Why Know Circuits? Chapter 8 of the U.S. Navy's basic electronics course of study, titled "The Series Circuit: Why Know Circuits?" introduces the concept of series electrical circuit analysis. After discussing basic characteristics and applications of resistors, capacitors, inductors, conductors, and insulators, analyzing series circuits are traditionally the beginning point for fledgling technicians, scientists, hobbyists, and engineers. Purely resistive series circuits have just one current path with the same value through every component, making calculations extremely simple. Things start getting a bit tougher when reactive components are introduced, but simple trigonometry takes care of that. The move into parallel circuits is typically the first barrier that washes out students least likely to succeed. A few guys in my USAF tech school had to change career fields after about the third weeks of Basic Electronics because they could not grasp parallel circuit analysis. One switched to being a Pavement Maintenance Specialist and got assigned to Minot AFB in North Dakota patching holes in the runway from B-52 wheels. Chapter 8: The Series Circuit - Why Know Circuits? You have a good chance to outrank the bull in the China shop - just try fooling around with circuits before you know what you're doing! After burning up a few instruments at one hundred dollars per copy, you'll probably wind up electrocuting yourself or your shipmates! Electrical circuits are the power carriers of the electrical system. When they are connected properly, they are efficient and trouble free. BUT, foul them up by improper connections and they'll put your whole system out of commission. The few circuits you have been made acquainted with are SIMPLE circuits - only a source, its load, and the connecting wires. Few practical circuits can be so simple. For example, it would be a terrific waste if EVERY electrical load had its OWN generator and its OWN feeders. Imagine the confusion of cables, lines, and wires if every light, every motor, every telephone, every heater, had its own separate feeder lines directly from the dynamo room. For reasons of ECONOMY and EFFICIENCY, therefore, most circuits are, actually VERY COMPLEX. They are designed so that ONE generator can feed MANY electrical loads. But no matter how complex any particular circuit becomes, it is one of three general types - the SERIES, the PARALLEL, or the SERIES-PARALLEL. Every electrical load is designed to contain a specific resistance and operate at a certain rated voltage. The resistance of the road controls the amount of current at the rated voltage. The proper type of circuit connection insures the load of its rated voltage and current. Imagine the fireworks if a searchlight got 200 volts instead of 95 volts. Or - you'd wait a long time for chow from a 220 volt galley stove connected on a 110 volt line. Both these things could happen by using incorrect connections. The first type-the series circuit is a ONE-PATH circuit. You can always recognize a series connection by two facts-it will NEVER HAVE MORE THAN ONE CONDUCTOR CONNECTED TO ANY TERMINAL, and you will find only ONE PATH from source to load (or loads) and back to source. Figure 37. - Voltage in a series circuit. Figure 38. - Voltages across separate loads. Et = E1 + E2 + E3, etc. E3 =the voltage drop of the third load. Et = 2 + 2 + 2 = 6 v.
12 v.= 3 v. + 9v. The searchlight circuit is a good example of this principle of a series circuit. The ship's voltage is usually around 120 volts. 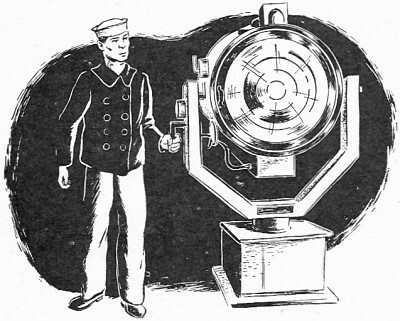 But the standard voltage for the Navy's largest searchlight is only 80 volts. In order to reduce the 120 volts to the operating standard of 80 volts, a resistor is placed in series with the light. This resistor uses up about 40 volts, leaving a drop of 80 volts for the light. (120 v. = 40 v. + 80 v.). Figure 39. - Control in a series circuit. It = I1 = I2= I3, etc. I3 = current through the third load. 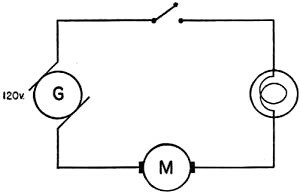 Suppose you connect a lamp, a switch, and a motor in series as in figure 39. The current through each part of the circuit is the same. If the switch is opened the current through the switch becomes zero - open circuit. Likewise, the current through both the motor and the lamp be come zero. The opened switch "shut-off" the loads. Switches CONTROLLING electrical loads are ALWAYS in series with the loads. In the same circuit, imagine that the lamp is broken. A broken lamp is also an open circuit and would stop the current through the motor and the switch. 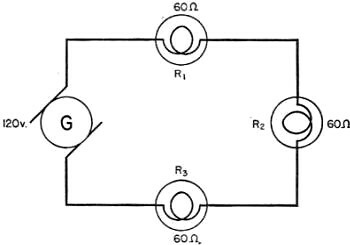 For this reason, two loads which are intended to be INDEPENDENT of each other, are NEVER connected in series. Figure 40. - Resistance in series. Rt = R1 + R2 + R3, etc. R3 = resistance of the third load. Figure 41. 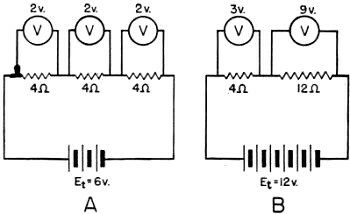 - Controlling current by series resistance. I = E/R = 120/40 = 3 amps. 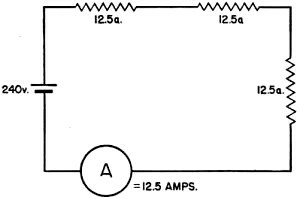 Now the current is limited to 2 amperes. 1. Draw a schematic of your problem. 2. Label each value on the schematic that is known. 3. Determine WHAT it is that you want to know. Is it the CURRENT, VOLTAGE, RESISTANCE, POWER, EFFICIENCY, INPUT OR OUTPUT? 4. Select the equation for your solution and use the EASIEST form of the equation. If you are looking for CURRENT, use I = E/R. If you are looking for VOLTAGE, use E = IR. If you are looking for RESISTANCE, use R = E/I. 5. (IMPORTANT) Apply the law to either a PART or the WHOLE circuit. DON'T MIX UP YOUR VALUES. 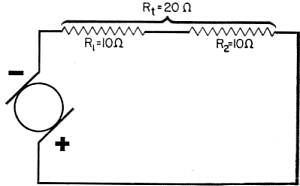 If you are looking for the resistance of a PART of a circuit, use the values or current and voltage for that PART. If you are looking for the TOTAL resistance, use the values of current and voltage for the TOTAL circuit. 6. Substitute the numerical values in your equation and solve. Figure 42. - Ohm's law. Figure 43. - Power equation. You've been given a pretty big dose of formulas and equations all at once. They're hard to take - so, here's a "crutch" to help you over the rough spots. 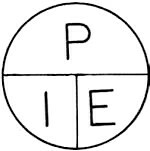 When you have a problem in current, voltage, or resistance sketch a "pie" and divide it into three pieces. Label each piece as in figure 42. Now, using your finger, cover up the quantity you want to know. What's left is the formula for solving for that quantity. For example, if you want to know current, cover I; E/R remains, and I = E/R. If you want to know the voltage, cover E; IR remains, and E = IR. Likewise, if you want to know resistance, cover R; E/I remains, and R = E/I. You can make the same kind of "pie" for the power equation. It's shown in figure 43. Simple, isn't it? Let's try it on a few problems. The BEST (not always the easiest) way to get a clear understanding of circuits is to work circuit problems. You will learn a lot by going through each of the examples which follow. Each example has been selected to illustrate a practical circuit problem. Figure 44. - Example 1. Figure 45. - Example 2. Three lamps are connected in series. Each has a resistance of 60 ohms. A generator producing 120 v. of emf powers the circuit. 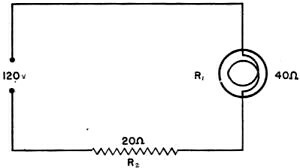 What is the total current in the circuit, and what is the current through each lamp? Rule 1. Sketch the circuit - figure 44. Rule 3. What is wanted? It, I1, I2 and I3. Rule 5. Use I = E/R first, for the TOTAL current, and then, for the current of EACH LAMP. Rule 6. Use It = Et/Rt = 120/180 = 2/3 amp. I = E/R = 120/40 = 3 amps. ABSOLUTELY WRONG. Two lamps are connected in series on a 240-v. line. 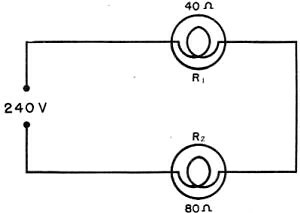 One lamp has 40 ohms resistance, the other has 80 ohms resistance (see figure 45). What is the total current and power? What is the current and power of each lamp? It = Et/Rt = 240/120 = 2 amps. It = I1 = I2 therefore I1 = I2 = 2 amps. Pt = EtIt = 240 x 2 = 480 w.
The power of each of the two lamps can be found in two ways. E1 = I1 x R1 = 2 x 40 = 80 v.
E2 = I2 x R2 = 2 x 80 = 160 v.
P2 = E2 x I2 = 160 x 2 = 320 w.
(2) In the equation P = EI, substitute for E the value of IR. Figure 46. - Example 3. 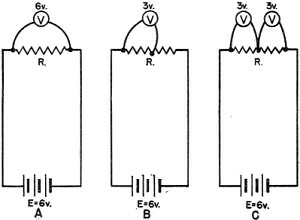 P1 = I12R1 = 4 x 40 = 160 w.
P2 = I22R2 = 4 x 80 = 320 w.
Figure 46 shows three 1,000 watt heaters connected in series to a 240-volt battery. Each heater has a current of 12.5 amperes. (1) What is the total resistance? (2) Resistance of each heater? (-3) Total current? (4) Total power? (3) It = I1 = I2 = I3 = 12.5 amps. (4) P1 = E1I1 = 240 x 12.5 = 3,000 w.
or Pt = P1 + P2 + P3 = 1,000 + 1,000 + 1,000 = 3,000 w.